Hi all, currently having some issues with trying to run a ROM compiled by devkitARM, however I'm not compiling things in the manner as recommended since the original project wasn't set up in the way devkitPro's example code works. currently I've managed to get it compiling with a few makefile tweaks, but since I'm using my own makefile and not building this in the way recommended for this compiler, I run into "Unsupported ARM mode 00" when trying to run the compiled gba file. I can progress past this error if I run the ROM through the "gbafix.exe" but running the ROM again simply produces a white screen, when I would normally have a few dancing sprites when compiling with DevKit Advance. Reducing the "main" function down to nothing but an empty loop doesn't fix it either, I still get the same white screen. Not sure of what else I could be missing at this point. Any help would be greatly appreciated cause the lack of C++11 features are killing me right now. I am running the ROM through VisualBoyAdvance. When using gbafix.exe I am simply dragging the .gba file onto the exe to get it to run. Firstly please note that devkitPro is an organisation not a toolchain. You're attempting to move to devkitARM, not devkitPro - I've edited the post accordingly. Looking at the Makefile you provided it appears you have a src subdirectory in the same directory as the Makefile - it should therefore be relatively easy to just replace your Makefile with our GBA template and edit some variables. Reducing the "main" function down to nothing but an empty loop doesn't fix it either, I still get the same white screen. Not having any code other than an empty loop will display a white screen, I'm not sure what else you'd expect. If you'd used a standard Makefile you'd only need to call make. And the standard Makefiles run gbafix as part of the build. Quite bad, sorry. You appear to be using the wrong compiler to start with. Please don't tell me you renamed devkitARM binaries . It would be easier to help if we can see the actual project you're working on. Hit us up on IRC if you can & you don't want to post links to it here yet. Yeah, that'smy bad. Noticed that after I had already posted. My file structure is fairly different, which is the main reason the makefile didn't work off the bat. Currently I've got each .h and .cpp paired up, using subdirectories to organise everything. VisualBoyAdvance normally displays a black screen in these cases. 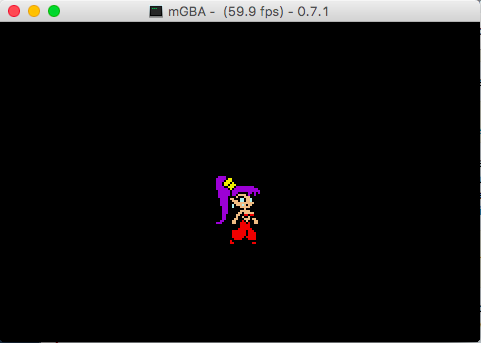 Will look into mGBA. Yeah, it's had been a long time since I had ever written any make file since my Uni days and that was the first time I had written a 'generic' makefile. I haven't touched any of the devkitARM binaries, but you might be right about it running the wrong compiler since the "-mcpu=arm7tdmi -mtune=arm7tdmi" gives errors that they aren't supported. Will try modifying the example makefile to my file structure next instead of modifying my makefile to fit this new compiler.